The steep, rocky shoreline of South Texada Park makes access by boat very difficult. Anderson Bay Provincial Park is a separate parcel located on South Texada’s eastern shore. It provides well-protected anchorage from all sides except the southeast. The small island and peninsula are included in the park, but the head of the bay is private land. Black-tailed deer, birds and intertidal life can all be found in the park. South Texada Island has many old roads that are suitable for mountain biking and hiking. This park has opportunities for fishing, kayaking and hiking. However, there are no camping facilities or other services provided at this park. Park Size: South Texada is 900 hectares and Anderson Bay is 35 hectares. 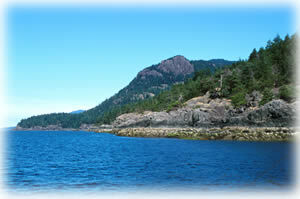 South Texada Provincial Park is located on the southwestern side of Texada Island. Anderson Bay Provincial Park is located on the southeastern side island. Approved Purpose Statement and Zoning Plan [PDF] for South Texada Island Provincial Park is available online in pdf format. There are opportunities for canoeing and kayaking in this park. However, this park is not on any common kayaking routes. There is tidal water fishing available. Anyone fishing or angling in British Columbia must have an appropriate licence. This park is open to hunting. Please refer to the current annual Hunting and Trapping Regulations Synopsis for more details and regulations. All hunters must have valid licences and tags. Pets/domestic animals must be on a leash at all times and are not allowed in beach areas or park buildings. You are responsible for their behaviour and must dispose of their excrement. Backcountry areas are not suitable for dogs or other pets due to wildlife issues and the potential for problems with bears. All domestic animals must be on a leash at all times. Fires are permitted on the beaches below high tide line only, no wood is available.